Typical of our time in China, we were up early the next morning. Traci would wake up a little earlier than me to do her yoga DVDs that she brought with her. She did not have too much time because we had to eat breakfast and be on the bus by 8 AM. We had a full itinerary every day. 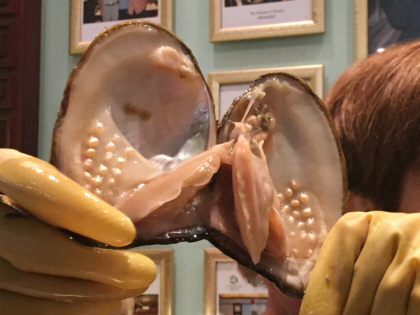 Our first destination was a shopping stop at a pearl factory. These factory/shopping stops normally began with someone giving us a briefing on how to determine quality. We would then be released into a showroom where we could make purchases. Traci and I did not buy anything. Traci would at least have a look around. I wasn't interested in shopping so I usually found a seat or chatted with others in our group until it was time to get back on the bus. The Summer Palace was our next destination. 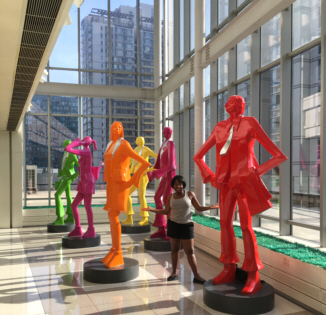 I was starting to discover that the Chinese do things on a grand scale. The Summer Palace is a huge property that served as a retreat and home for emperors. 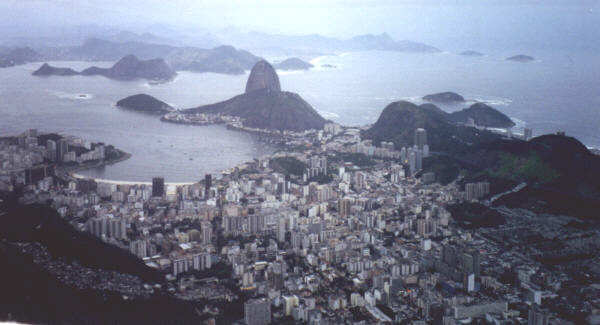 It is full of horticulture and more than 3,000 buildings/structures. 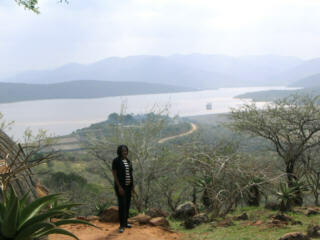 It also contains a large man-made lake. Our guide led us through parts of the very crowded grounds stopping to provide commentary along the way. The Summer Palace was originally constructed in 1750 but was destroyed and rebuilt over the years. One of the most notable reconstructions of the Summer Palace was ordered by Empress Dowager Cixi in the late 1800's. She embezzled money from the navy to finance it. 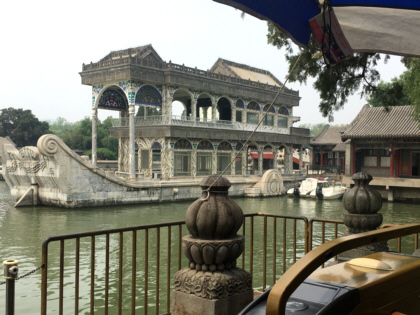 Although we were allowed to take pictures at the Summer Palace, our guide had been warning us on the bus and several other times as he led us around that we would enter a courtyard where we were not allowed to take pictures. We finally arrived at the courtyard where there was a large boulder. It was then I found out he meant we were not allowed to take a picture of the boulder. He explained that there are several superstitions in Chinese society. Apparently, this particular boulder was one of these beliefs. He explained that photographing it would bring bad luck. During our time in China, we would learn about other superstitions in Chinese society - both ancient and modern day. 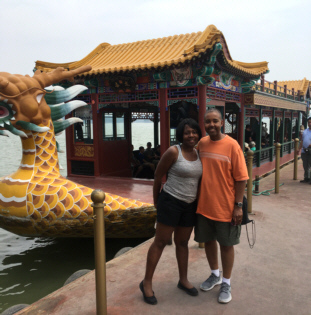 We were given time to explore the Summer Palace on our own on this hot, sticky day. We walked under the intricately-painted Long Corridor that the Empress and other royalty used to stroll. We saw the Marble Boat (boat made of marble). There were amazing things to see everywhere we turned. 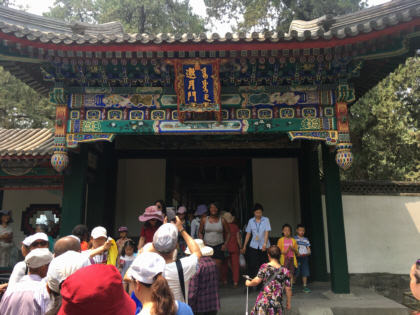 Our visit to the Summer Palace was where we really experienced the Chinese fascination with foreigners. There were people trying to sneak pictures of us. Others would stop us to take a picture or to take a selfie with us. Some people would just stare. Whereas we experienced this only once in Hong Kong, we experienced this several times per day during the rest of our stay in China. We had a family-style lunch at a Summer Palace restaurant that had traditional Chinese decor. The waiters were dressed in traditional Chinese attire as well. 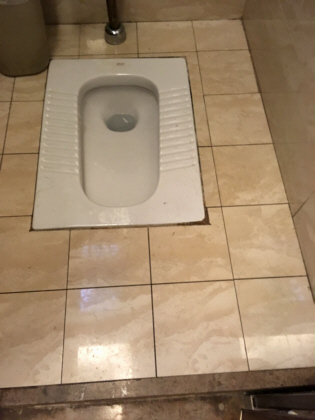 We were sure to use the restrooms at the restaurant because our guide had given us a heads-up that the restaurant had Western toilets as opposed to squat toilets. Restrooms outside our hotel were hit or miss. They often had squat toilets which many of the women in our group disliked. 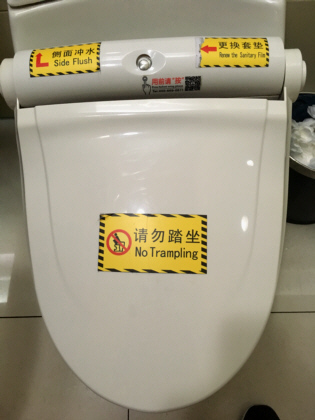 China started installing more Western toilets at tourist sites but this created confusion for the Chinese who thought they were supposed to stand on the seat and squat. Signs needed to accompany the Western toilets to discourage this behavior. There was also no guarantee that you would find toilet paper. If there was toilet paper, sometimes the dispenser was outside the stall or outside the bathroom meaning you would have to estimate how much you needed to get the job done beforehand. Traci and I always carried our own toilet paper in our bags. Although it was rare to encounter a restroom with no soap, we also carried a package of wet naps. 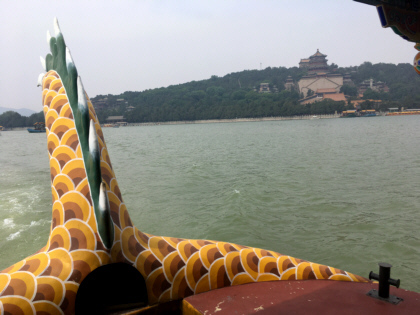 After the lunch, our group crossed the huge man-made lake in a dragon boat. 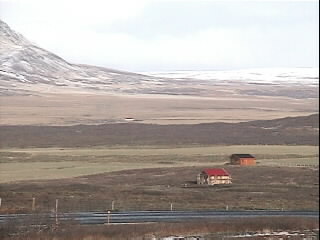 We boarded the awaiting motorcoaches and were driven to our next destination - the hutongs. 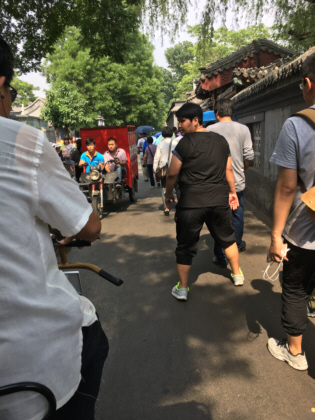 Hutongs (alleys) have existed in Beijing since the Yuan Dynasty (1271–1368). They represent ancient neighborhoods. 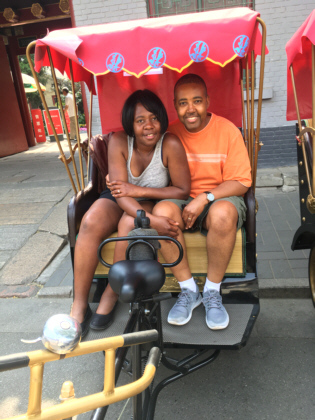 We toured a hutong via a 25-minute rickshaw ride. The hutong we rode through had mainly restaurants and bars. In my mind, I nick-named the rickshaw driver that Traci and I had The Grinch. The bell on his rickshaw was not very intimidating but his raspy voice was. He would yell at people to get them to move aside. I don't speak Chinese but whatever he was saying did not sound very nice. He almost ran into an elderly woman then yelled at her. The buses returned our group to the hotel around 4:00 PM. This gave us a short break before the 5:30 PM dinner. Traci and I used the break to walk across the street to the large shopping mall. 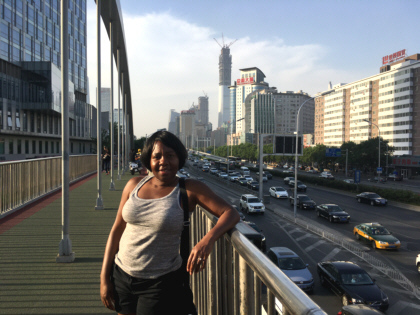 I was so happy there was a pedestrian bridge we could use. There was no way I wanted to risk my life crossing the street in that crazy traffic. Someone in our group described crossing a street in China as being like playing the old video game Frogger. The pedestrian bridge had its hazards too but not as scary as the streets. It seems everyone walks and texts so we were constantly dodging people who had their nose in their device. There were also people riding bicycles and mopeds on the bridge and sidewalks.